The Sortavala region was well situated for trade and communications. During the Viking Age(800–1100 AD), furs from the north passed through this area to the trading route in the southern part of Lake Ladoga. Traders and merchants settled in the Sortavala area in the late 15th century. Information on the Lake Ladoga region of Karelia was recorded in the tax records of the district known as the Vodskaya pyatina ("Vod fifth"), listing almost 40 merchants in the administrative parish of Sortavala. Their large number was apparently due to extensive trade with the regions of Savo and North Karelia in present-day Finland. Numerous wars were the fate of the Sortavala region. The local population suffered from the power politics of both Sweden and Russia. The area was already defended in the 12–14th centuries from hillforts. Over fifteen hillforts are known from the vicinity of Sortavala. Russia ceded the Lake Ladoga region to Sweden in the Treaty of Stolbova in 1617. At the time, Sortavala had a population of approximately 500–600. The founding of the town of Sortavala was decreed by King Gustavus II Adolphus of Sweden on the 17 June 1632, during the Thirty Years' War. In 1705, Sortavala was burnt by the Russians in the Great Northern War. Adding to the destruction were famine and an outbreak of the plague. 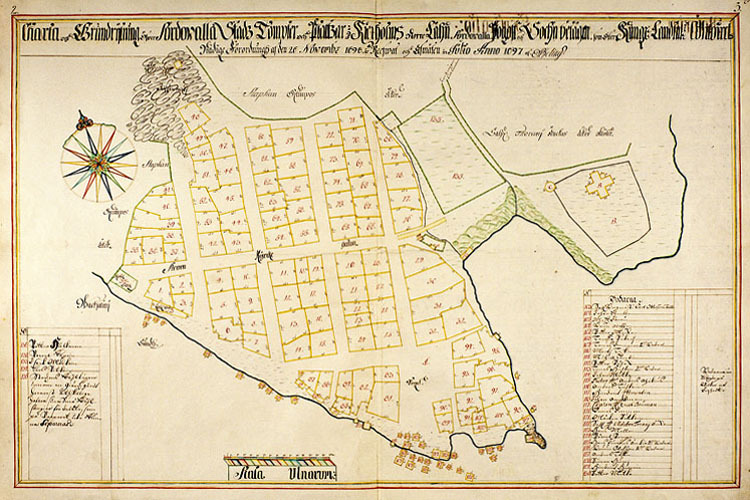 In 1710, Sortavala was joined to Russia. The annexation was ratified in the Treaty of Uusikaupunki in 1721. The old trading routes to the north were cut off and Sortavala lost its charter. The town charter was restored in 1783, when Empress Catherine II ordered it to be a district town of the Russian administrative system. The growth of St. Petersburg promoted trade and led to the establishment of the region's first lumber and quarrying enterprises. The Finnish War of 1808–1809 marked a turning point in the history of Sortavala. Finland was joined to the Russian Empire, and slightly later the formerly ceded areas known as Old Finland were added to the Grand Duchy of Finland. New town plans were drafted to develop the growing town. In 1863, the town plan by Carl Albert Edelfelt was officially ratified. The economic basis of development was provided by new sawmills, a shipyard and trading houses. In 1893, the Karelia railway line was opened to traffic, which led to large-scale trade with the city of Viipuri as its focus. Trade with St. Petersburg remained brisk until Finnish independence in 1917. One of the most important cultural and educational initiatives of the town was the Sortavala Teacher Training College, established in 1880 through a donation from Privy Counsellor Herman Hallonblad and his wife Elisabet. From its founding the college had a definite impact on the life and future development of Sortavala. Cultural pursuits began to thrive in Sortavala during the era of the autonomous Grand Duchy of Finland. In 1896, the Finnish Popular Education Society held a festival of music and song at Sortavala, which marked the beginning of a tradition. These festivals were held in 1906, 1926, and in 1935, the centenary of the published version of the Kalevala epic. After Finland became independent in 1917, the border with Russia was closed. Trade from Sortavala across Lake Ladoga declined and became non-existent. It began to develop again in the 1930s, but was cut short by the Second World War. After the Finnish–Soviet Winter War of 1939–1940, the inhabitants of Sortavala had to evacuate. This experience was repeated at the end of the Continuation War of 1941–1944. Civilians had to leave the city by the 11th of September 1944. The last Finns left Sortavala on the 23rd of September, and the Soviets arrived in the city on the same day. During the Soviet Era the town was practically forgotten by the outside world. Sortavala was situated in the restricted border zone, visitors needed special permission in order to get to the town. The Perestroika Era and the collapse of Soviet Union opened up the border zone. Foreign visitors were allowed to visit the town since 1988. The opening of the Russian border started unique type of tourism Finland to ceded Karelia: trips to the native and former living places, which mean very much to the evacuated Finnish people. In addition to Karelians remembering their lived experiences in Karelia, they will take some souvenirs with them as well as water of their own lake, the soil, and plants. At present, some 22,000 people live in old Sortavala, and 36,500 in the area of the city. The inhabitants are of different ethnicities. The largest groups are Ukrainians, Belarusians and Russians. Less than two per cent of the population are Finno-Ugrians. Administratively, Sortavala belongs to the Republic of Karelia.